The death of a 48-year-old woman is raising serious concerns about the housing and mould crisis in a northern Ontario First Nation. 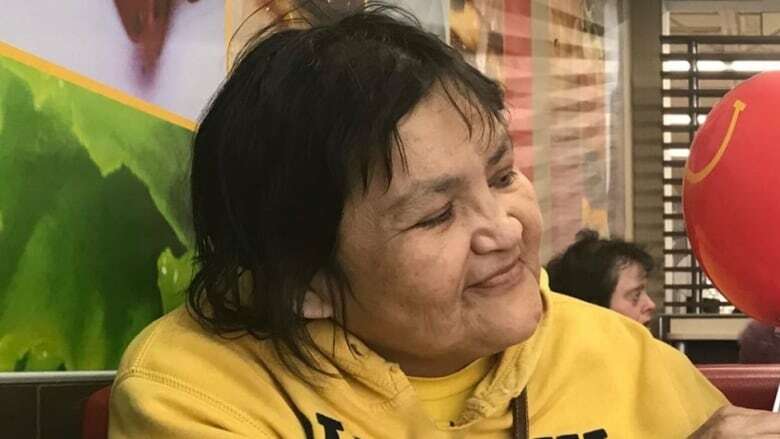 Nashie Oombash died on Monday, three weeks after she left the Cat Lake First Nation to seek medical care in Thunder Bay. Oombash's cause of death is unknown pending an autopsy. But her sister said she believes exposure to mould contributed. "She died from the house, from the mould," said Rita Wesley. "She lived on a hill full of mould. In the basement, it's just full of mould under there and nobody really looked into it to clean it up." Last month, the remote First Nation 600 km north of Thunder Bay declared a state of emergency due to the severe housing and mould crisis. Chief and council believe long-term exposure to mould is affecting the health of at least 100 residents. "People in Cat Lake get sick non-stop," the community's Deputy Chief Abigail Wesley said during a media conference at Queen's Park on Friday. "Coughing, multiple pneumonia incidents, related kidney diseases and increased medical problems." 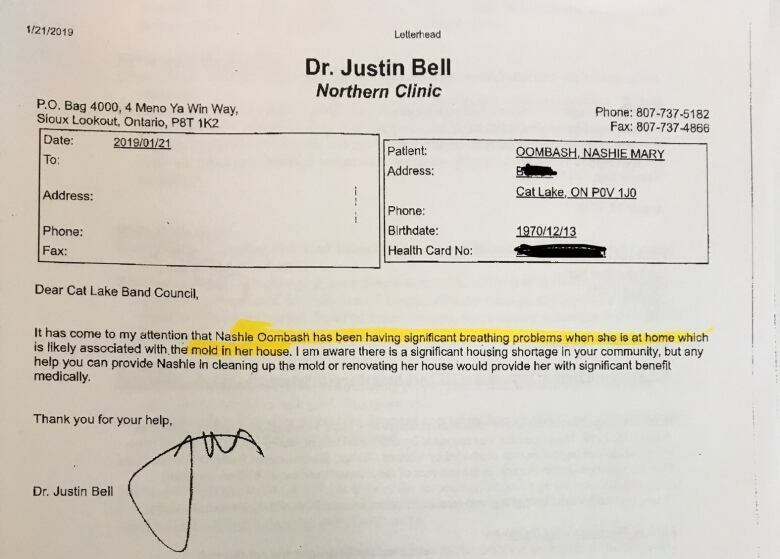 A letter from Nashie Oombash's doctor expressing concern about the mould in her home. 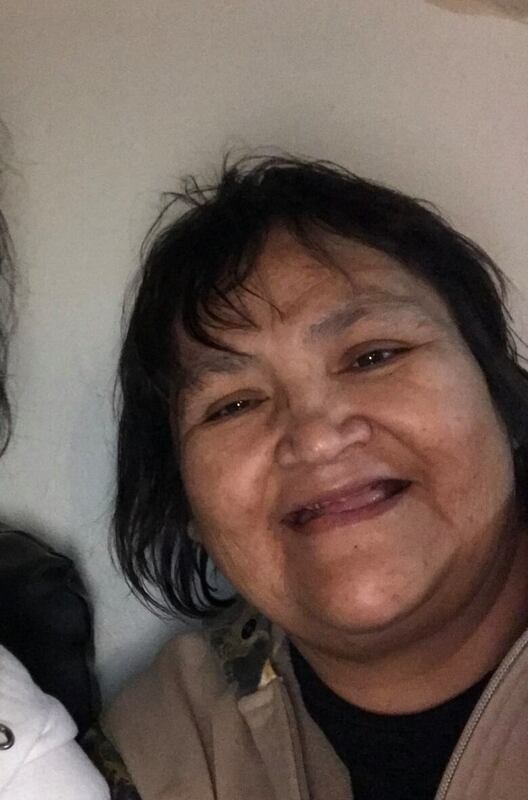 Rita Wesley, who is also a health director in the First Nation, said she sometimes accompanied Oombash to the nursing station to seek help for her respiratory issues. "Then she would be just [be] sent home, you know just to rest and relax," she said. "Home is not where we rest; home is where we get sick from. Our homes are not safe." CBC News spoke to Nashie Oombash about her health issues 10 days prior her death. Along with suffering from diabetes, she said she often suffered from breathing problems that got better when she left her home in the community. One of Oombash's doctors wrote a letter to chief and council about her respiratory issues on Jan. 21, 2019. "Oombash has been having significant breathing problems when she is at home which is likely associated with the [sic] mold in her house," the letter said. According to a report commissioned by the First Nation, 87 houses in the community need to be completely replaced due to mould and other problems. Councillor Abigail Wesley said her community is frustrated by the lack of action from the federal government to help them deal with the crisis. "Medevacs occur almost daily," she said. "As a matter of fact, we have almost 100 children needing assessment for serious health issues. The federal government continues to ignore, and demand more paperwork, proof, and study." Ontario NDP MP Charlie Angus said he doesn't know what it will take for the federal government to see the northern Ontario reserve is in a health crisis. He also said discussions are underway about bringing in a non-governmental organization, such as the Red Cross, to help. I am deeply saddened to learn of the death of Nashie Oombash of <a href="https://twitter.com/hashtag/catlake?src=hash&amp;ref_src=twsrc%5Etfw">#catlake</a>. <br>She suffered repeated bouts of pneumonia and hospital trips because of the damaging effects of mould.<br>Her system deteriorated and now she is dead.<br>She deserved better.<br>What is it going to take Canada? The office of Indigenous Services Minister Seamus O'Regan said the minister contacted community leaders on Tuesday night to express his condolences following Oombash's death. O'Regan will meet with band leaders on Thursday in Thunder Bay. "We're meeting tomorrow on a relatively detailed plan on housing for the community over the next 18 months," he told reporters in Ottawa. "I think that we're moving relatively quickly." Cat Lake's leadership said if a plan of action is not agreed to soon, they are considering evacuating the community. Rita Wesley said she hopes it doesn't come to that. "You know we love our home too. We don't really want to leave. So we just have to live with it and slowly suffer with it. That's the way we're living. We're slowly suffering, slowly dying." She hopes that help arrives soon for the community. "We want better housing. Bring the lumber in. Do what you can. Never mind about money. Don't tell me it's a money issue. You know I don't want to hear that. We're human beings too." O'Regan said that he is planning to visit the community to see the conditions first-hand.